Magnepan really likes to do something different at audio shows, and CES was no different. Here, Wendell Diller was running a bass demo -- namely, how Magnepan can do bass. It’s probably the biggest criticism of Magnepan as a brand and planar speakers as a design — to do bass, you really need excursion. Now, a good planar, being a dipole, does bass differently than a box speaker. That much is obvious — a planar can’t “excurt” like a traditional driver, and if it does, it’ll probably sound like trash. No, what you need here is surface area, and lots of it. Which is problematic. Sound Lab gets away with it by making enormous panels. Magnepan used to do the same thing, with their multi-panel Tympani system. Perhaps to the eternal lament of their fans, the Tympani has been retired for many years. In its stead, Magnepan has released a suite of single-panel designs that I, for one, feel are their best-sounding designs to date. But … these designs still suffer from “lack of surface area”. Sure, the bass they have is fast, and since it’s a dipole, it won’t couple to the room in the normally deleterious way that box-bass will, but there’s this chest-thumpiness to a properly room-coupled speaker system that a Maggie might not pull off in larger spaces. Or not to the degree bass-freaks (like myself) would prefer. 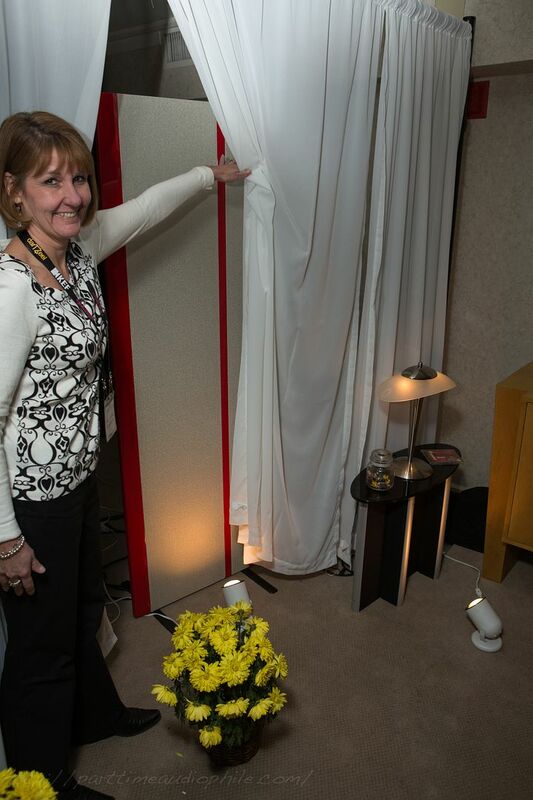 Shown here at CES, a poorly-obscured pair of Magnepan 3.7 loudspeakers sat about 12″ behind a white curtain, hidden from view. To one side was a table with a pair of Oppo players and some Bryston gear. To the other, a full set of Tympani loudspeakers sat on passive display, bracketed by a decorative and distractingly tall set of potted plants that probably could have been trees, if someone had had the decency to plant them. Other than the chairs, the only thing in front of the curtain were a pair of side tables. Flowers sat on one and a lamp sat on the one opposite. Both side tables sat about 12″ in front of the gauzy curtain and near, but not on, the side walls. Wendell kicked off his 6-song demo list, playing through a short passage from each piece, showing off the bass and mid-bass elements in the various types of music. At some point, during each piece, the room seized me by the throat and shook me like a wet dog. Um, yeah. Maggies aren’t supposed to do that. This was bass. Ahem. When the demo concluded, Wendell let us peek behind the curtain at the CCR center channel that was used to “fill in” the stereo image, and he casually pointed out the DWM woofers (not sub-woofers) tucked into the side tables. 5 loudspeakers, stereo music, and a Bryston 3-channel system. And I was wowed. I’m still not sold on the 2-channel+center approach — that seems unnecessary, to me. But what doesn’t seem optional, at least to my bass-addicted brain, is a 2+2 approach. Set up this way, with a single DWM coupled inline with each 3.7 channel, the sound was fast, immersive, coherent top-to-bottom, and had a dynamic wallop that I am entirely unused to out of the Maggies I have at home. Shows provide an excellent opportunity for us to test concepts. Virtually every electrostat and ribbon mfgr. has used dynamic woofers. But, maybe there is another way to move enough air with a planar speaker? A bass panel that utilizes boundaries is an efficient way to supplement a full-range ribbon or electrostat that is too small for a given room. The Maggie Bass Panel is a modular approach to achieve whatever it takes. So, not exactly new, no — but certainly new to me and a real eye-opener. Got bass issues? Got WAF issues, too? Magnepan may have your solution for you. Way to go, Wendell, nicely done. Any ideas of dealer in america who does sell 20.7 and ship as an export sets (in original condition) to Asian country? No, but you could probably call Magnepan to ask. With any properly configured 2CH setup, there should be absolutely zero need for a center speaker. To me, this seems like a way to try to sell customers on three speakers instead of two. Having something in between the front left and right speakers like a TV or a big equipment rack actually *messes up* the center image, this is why the best systems have the equipment off to the side and leave the area in the center completely clear (other than perhaps monos on the floor). Let’s leave the center channels for home theater where they belong. I think there are many old-schoolers that would agree with you. Purity! In all things! And if the goal is to sit, alone, in your Darth Vader meditation chamber, you’re on the right track. If, however, you wanted to share with your significant other — or a group of folks sitting sub-optimally at an audio show — a center channel does wonders for widening the sweet spot. They use a center channel at shows because it allows them to increase the size of the sweet spot so they can accommodate more listeners in the demo room. This sometimes leads to confusion, since people assume that they’re showing the center channel as part of the setup. I gather that their goal here was to demonstrate the effect of adding the DWM woofers in rooms that can benefit from more bass (it isn’t needed in all of them), and to get feedback on the concept, which from what I’ve seen has been overwhelmingly positive. Yes, I am also curious about the demo tracks! It is a real pleasure to read your “confessions” and the photos are great. Is it good? I own the maggies 3.7 running with dual sub. I’m currently quite happy with that set up. But with this new maggie woofer, i’m very curious about its bass. Eager to audition. Wonder if it’s real good? Wonder if dual maggies woofers bring better result? Tks for this really hot news. Why doesn’t magnapan re issue the timpani’s as a limited edition anniversary system? In my audio infancy, aside from Fried’s, the Timpani’s were one of the 1st high end speakers I was exposed to! What a sound! No mention of cost of dsm’s? Also, curious as to the 6 demo tracks used? I’m guilty of being a long standing bass afficiaonado! Seamless you say? Amazing! I had Tympani 1D’s for many years, and recently upgraded to a pair of IVa’s. They show up periodically on Audiogon and Magnepan can restore them to like-new condition, or you can do it yourself with an inexpensive kit they sell if you have the time. If you have the room, they may be the best buy in audio today.